This book is a key research work that provides the biblical student with information concerning the historical growth and progression of the Holy Scriptures. It could be academically titled "The Design and Development of the Holy Scriptures." 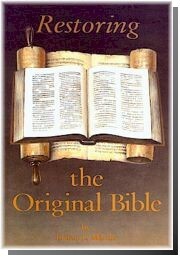 It shows from clear historical and biblical records that our modern Bibles have abandoned the order and arrangement of the books as they left the hands of the prophets and apostles who canonized them (though they do contain all the books of the Holy Scriptures in the normal Protestant versions). It was in the early fifth century that Jerome gave to the world our present (and erroneous) arrangement of the books of the Bible. This order of Jerome is at variance with the early manuscript design. When the original arrangement is restored, a marvelous and harmonious context is shown that reveals truths of the Scripture that could not be seen otherwise. The intended design by those who canonized the Bible (which can be easily shown and proved) provides the modern reader with the accurate type of Bible that the prophets and apostles desired the world to have. Even modern scholars around the world have argued that the Holy Scriptures should be restored to their pristine and proper order of the manuscripts (as shown by Dr. Martin in this book) so that modern man can have the same Bible that left the hands of those who canonized it. Potential markets include Bible students, professors, teachers and theologians, pastors, libraries, seminaries, universities, and lay people of all Christian faiths. "Martin's work is a fascinating adventure into the world of late 2nd Temple Judaism and emerging Christianity. It not only deals with little understood aspects of the early "canonization" of both the Old and New Testaments, but it captures the "sound and fury" of those turbulent times surrounding the deaths of the apostles and the Fall of Jerusalem to the Romans in 70 A.D. This book is highly recommended for students, non-specialists, and academics alike." - Dr. James Tabor, Dept. of Religious Studies, UNC-Charlotte.